Check out our Frequently Asked Questions below. If your question wasn't answered, please contact us. We're happy to answer your questions! Do you have an attached hotel? We do not have an attached hotel, but more than 900 hotel rooms are within a 10 minute walk. There are two hotels located directly across the street from the Penticton Trade and Convention Centre. As Penticton’s premier event venue, we have strong partnerships with the city’s hotels, so attendees will receive the best possible room rates. Please contact us directly by phone: 250.490.2460, email: ptccinfo@penticton.ca or through the completion of our online form. One of our team members will connect with you. What is included in a meeting room rental? Is there an exclusive food and beverage provider, or can I bring in my own caterer? Our in-house, food and beverage team is the exclusive provider of all catering services at the convention centre. You cannot bring in outside food and beverage. Our catering team brings years of experience and skill to the table(s). Chef attended action stations, deliciously themed buffets, exquisite plate presentations, and decadent desserts contribute to our food and beverage excellence. As the exclusive provider, your event's beverage services fall under our liquor license. We are responsible for the sale and service of alochoilc beverages in accordance with the Liquor Control and Licensicing Act and Regulations. Is there an exclusive audio visual provider, or can I bring in my own? Our preferred in-house AV provider is SW Audio Visual. We encourage clients and guests to experience the outstanding customer service, wealth of knowledge and wide range of equipment available from SW Audio Visual. We do, however, allow clients to bring in a their own provider or there own equipment. There is no cost or penalty for this. Is there an exclusive show decorator? ShowTime Event & Display is our preferred show decorator. A sister company to SW Audio Visual, ShowTime Event & Display has worked with our clients for decades. They've assisted many of our provincial and national association clients in their trade show components and also consumer show clients. What are your exclusive services? dedicated temporary utlity services including: power, compressed air, water fill/drain services. How high are the ceilings in the ballroom? The “clear” ceiling height in Ballroom 1 and 2 is 17’ 6”. There are no pillars, obstructions or hanging chandeliers in the ballrooms. The “exposed” structural ceiling truss is 18’. Our space is inviting and accessible for everyone. As a single-level building, with very few access barriers, our 60,000 sq. ft. "bungalow" is ideal for wheelchairs and mobility-restricted patrons. To enter our facility, there are no steps, inclines or declines. Motorized door openers, convenient designated parking stalls, accessible washrooms and a metal ramp for stage, dot the “i” on accessible. Everyone has different needs. Our dedicated employees are here to help. How many attendees can you host? Depending on the type of event, our configurable rooms do it all! We can accommodate intimate groups as small as three and host groups as large as 3,500 attendees. We need to broadcast our event. Do you have the infrastructure to facilitate this? We offer several connectivity options for live broadcasting from the facility, including dedicated 5 Mbps and 25 Mbps broadcast connections. 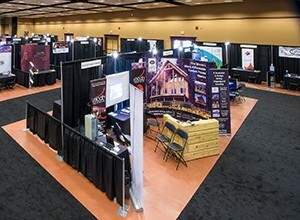 For a fee, the Penticton Trade and Convention Centre has the option for wireless connectivity. Does the convention centre have carts that we can use? We have a limited number of small flatbed carts available on a first-come, first served basis. Availability is not guaranteed. It's strongly advised, if you're an exhibitor, to bring your own cart or check with you show decorator. Are you a union facility? No, we are not a union facility. When do I need to tell you my final catering numbers? Final numbers are due five business days before each event. It is the client's responsibility to communicate dietary restrictions of their event attendees. This must be shareed with our catering manager five business days before the event. How do I order temporary utility services (electrical connections, compressed air, and water fill/drain services)? Please click here to order dedicated power, and any additional services for your upcoming trade show booth. Can I hang posters on the walls? If you're in our Ballrooms, we have a picture rail. The picture rail is ideal for hanging your event banners and posters. Posters using special putty or painter’s tape can be used throughout the venue. I forgot to order show services. Can I order onsite? Yes, you can order onsite. Prices increase for onsite purchases. Please see our venue's event manager, or click here. I'm an exhibitor and shipping my booth. What do I do? If you're an exhibitor with a large delivery or shipment, please contact your show producer and or decorator. Each show has specific instructions. We do not operate a shipping and receiving department. All convention, trade show and consumer show must be coordinator through your show producer or decorator. Are there rigging points available? The ceiling consists of web-style trussing, which can be used to fly/rig for events. Capacities vary between 200-500 pounds per point. Spaced on 8’ centres, the truss beams run from east to west in the ballrooms. We offer an on-site rental lift specifically rated for the floor capacities in the facility. Can exhibitors give out food or beverage samples on the show floor? Food and beverage sampling is permitted in the some situations. If an exhibitor has food samples, the food portions must be 2 ounces or smaller size. If they have non-alcoholic beverage samples, the pours must not exceed 1 ounce. Our in-house food and beverage team is the exclusive provider of catering. Yes, our ground level facility is easy to load in and out. There are three loading bays. Loading Dock C has drive in access directly to Ballroom 2, the 16’ high by 16’ wide door offers convenient access. For smaller deliveries, two loading bays, on ground level are 10’ high by 10’ wide. For freight restrictions, scheduling and move in/move out procedures, please contact your show decorator or event manager. If you're an exhibitor or vendor of a consumer show, you will have received a map from your show producer identifying the lots you can park in. How do I purchase tickets for an event? 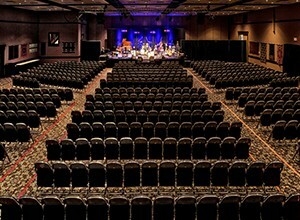 Ticketed events at the convention centre are availabile for purchase online at www.ValleyFirstTix.com, in-person at the Valley First Box Office (at the SOEC) and for some events by phone: 1.877.763.2849. The Valley First Box Office (at the SOEC) is open Monday to Friday 10:00 AM to 5:00 PM. During the winter, the Box Office is open on Saturdays. On event days, a satellite Box Office will be set up at the convention centre 1 hour prior to scheduled doors opening. You can purchase tickets at the satellite Box Office or pick up your will call tickets. My tickets are in will call. How do I pick them up? Will call tickets are available for pick up two weeks prior to the event. The Valley First Box Office (at the SOEC) is open Monday to Friday, 10:00 AM to 5:00 PM. On event days, a satellite Box Office will be set up at the convention centre 1 hour prior to scheduled doors opening. Will call ticket pick up is available then, and right through the event. There are 600 parking stalls at the Penticton Trade and Convention Centre. These free stalls are located just steps from the venue’s entrance. If the Power Street lot is full, additional parking lots are accessible off of Alberni Street, behind the convention centre. Please visit our parking map for more information. How do I get to Penticton BC? Penticton BC is about 45 minutes south of Kelowna. 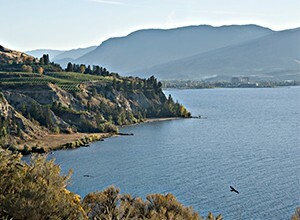 The City is located at the South end of Okanagan Lake. Sitting between Okanagan and Skaha Lakes, the views are stunning. Accessible by plane, to Penticton Regional Airport, and by car via two highways from Vancouver and the Lower Mainland, Penticton is very accessible. See more about the direct flights form Vancouver and Calgary here. Penticton Regional Airport, a 10 minute drive, from the convention centre is your gateway to Penticton and the South Okanagan. With direct daily flights to and from Calgary (WestJet) and Vancouver (Air Canada), you can fly in and out of Penticton easily. Can I walk to hotels, restaurants, shops, and attractions? Yes, Penticton is a very accessible and compact city. 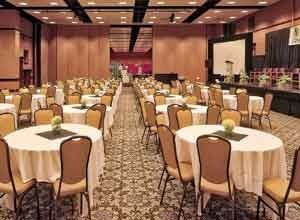 The convention centre is located a short walk to the beach, downtown Penticton, and many attractions. (We can even see a glimpse of Okanagan Lake from our North Patio). What are your administration office hours? The Penticton Trade and Convention Centre administration office is open from 8:30 AM to 4:30 PM, Monday to Friday. What are your sustainability practices? Through the use of green cleaning products, recycling and using the building’s automated cooling/heating system; we're reducing waste and utilities consumption. Does your venue have ATMs? Yes, there are two ATMs onsite in our pre-function space. We have a wheelchair that can be loaned out to clients or patrons. Please contact the event manager to request the wheelchair for an upcoming event. Where's your lost and found? If you've lost a personal item, please speak with one of our helpful employees. Found items are to turned into our event manager. Our event manager can be reached at 250.490.2466. We are not responsible for lost items. Found items are held for 30 days. We’re a smoke and vape free facility. Guests are prohibited from smoking, vaping or using e-cigarettes in the convention centre. There are designated smoking areas, with ash trays on the North Patio and out Entrance 2.